Once again, a vibrant crowd from every corner of Jewish South Palm Beach County came together in testament and celebration of the strength and joy of this remarkable, united Jewish community. 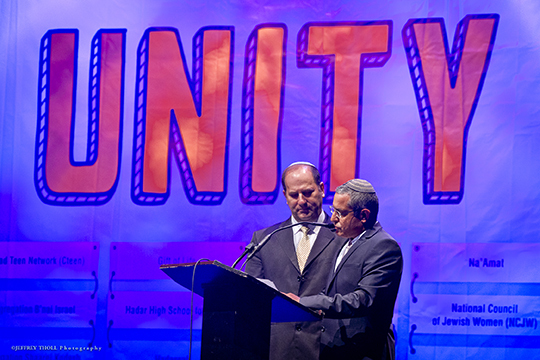 With 1,400 Jewish community leaders and members gathered in FAU’s Carole & Barry Kaye auditorium on June 13, they not only observed the fourth annual Jewish Unity Day. They also celebrated the Jewish community of South Palm Beach County’s recent receipt of the prestigious international Jerusalem Unity Prize. With a parade and onstage display of 71 synagogue, agency, school and organization banners, a live drum corps and a capella group, videos, many special effects and brief though powerful remarks, the unique multimedia, multisensory Jewish Unity Day experience clearly illuminated why Jewish South Palm Beach County received this year’s prize – and is the first community and the first group in the Diaspora to do so. This year’s event was delayed by a week, as a delegation of diverse South Palm Beach County rabbis and other Jewish leaders headed to Israel to receive the Jerusalem Unity Prize on June 6, in a ceremony at the residence of Israeli President, Reuven Rivlin. The Florida Jewish Home was the Jewish Unity Day event’s Newspaper Sponsor.